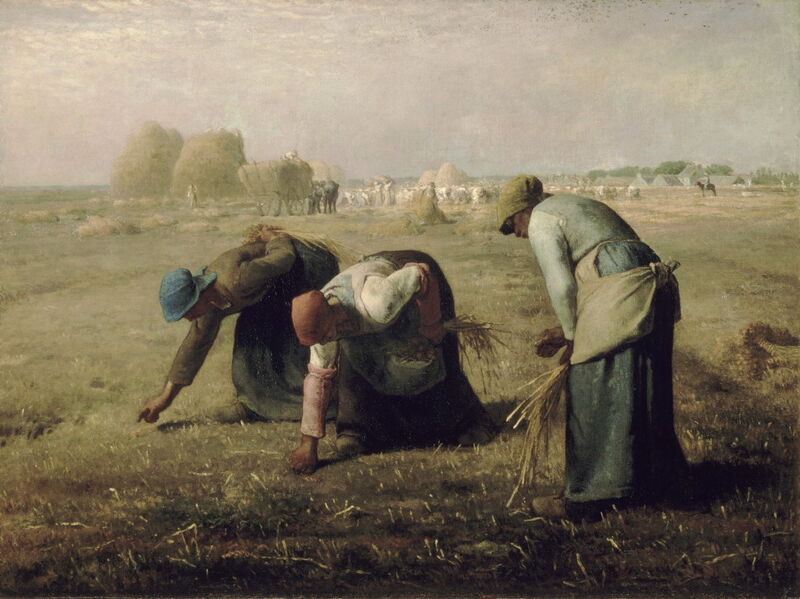 Jules Breton (1827–1906), The Weeders (1868), oil on canvas, 71.4 × 127.6 cm, The Metropolitan Museum of Art, New York, NY. Wikimedia Commons. If you’ve visited the Musée d’Orsay in Paris, or any other rich collection including the works of both Jules Breton and Jean-François Millet, you might feel hard-pressed to be able to distinguish between them. In the last few weeks, I have posted series of articles covering both of their careers, and shown most of their best paintings. This article compares and contrasts their work, to help us (me included) be clearer as to which is which. It’s also a good excuse to show again a selection of those superb paintings. 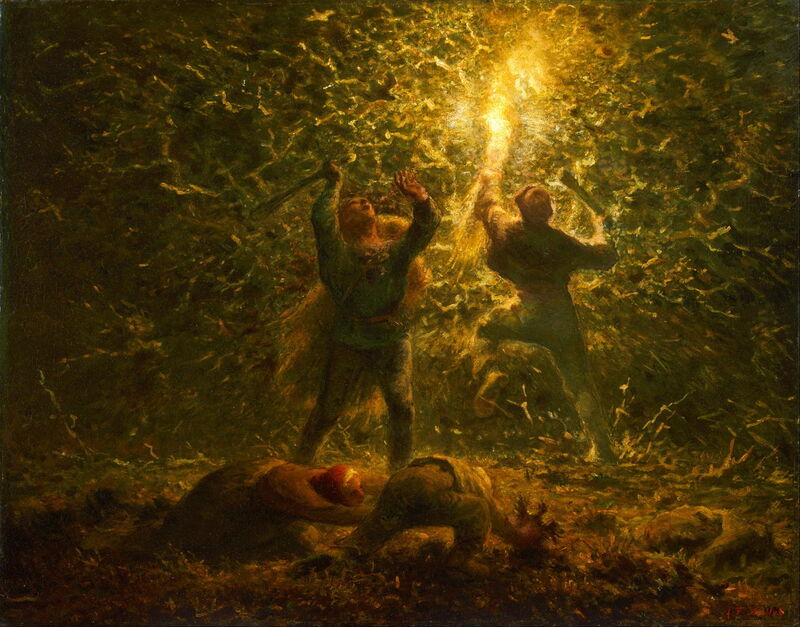 Millet was the older of the two, by thirteen years, and started his career with figurative and narrative work. They both achieved their early successes in the 1850s, with paintings of poor country people working in the landscape: in Millet’s case around Barbizon, and in Breton’s at Courrières in north-eastern France. It was in the middle of the 1850s that they converged on a common theme, that of the poor gleaning the remains left after the harvest, which perhaps shows most clearly their different approaches and styles. 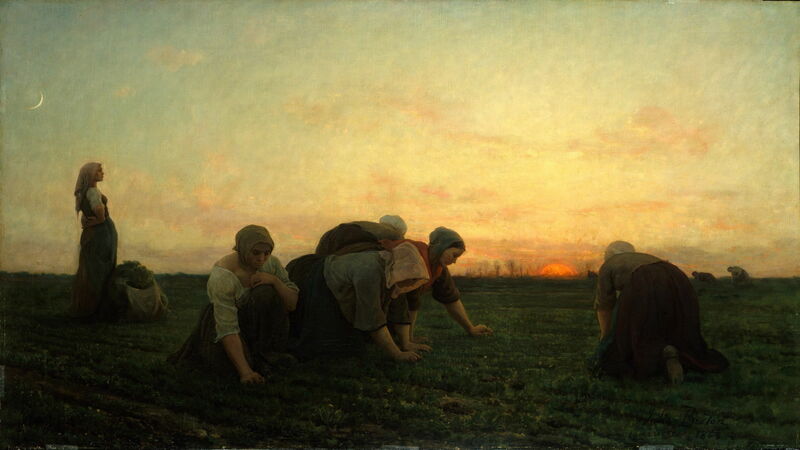 Jules Breton (1827–1906), The Gleaners (1854), oil on canvas, 93 × 138 cm, The National Gallery of Ireland/Gailearaí Náisiúnta na hÉireann, Dublin, Ireland. The Athenaeum. 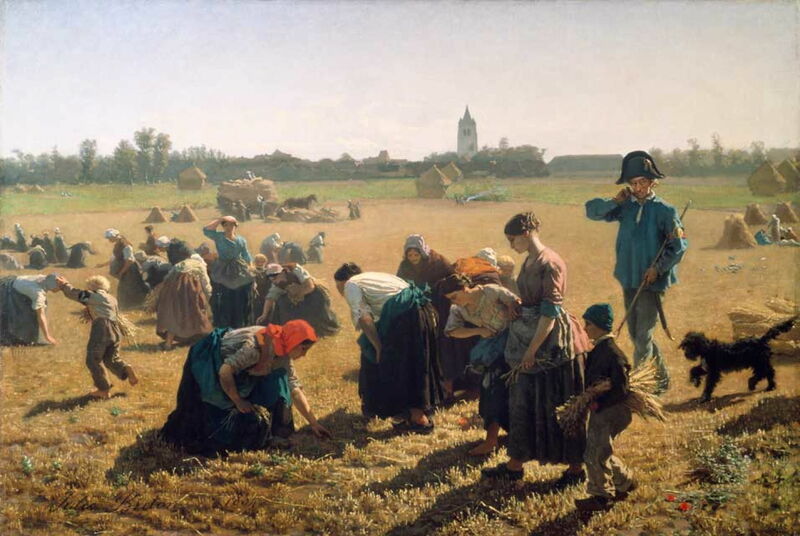 Breton’s The Gleaners (1854) is the first of his major ensemble paintings, featuring his meticulous realism. It is richly populated using figures which he had worked up in studies over the previous years, each showing great detail in their dress, carefully composed in a scene which never really existed except in the artist’s mind. Light and colours are bright, and the whole finished to Salon standards. Jean-François Millet (1814–1875), The Gleaners (1857), oil on canvas, 83.5 × 110 cm, Musée d’Orsay, Paris. Wikimedia Commons. Three years later, Millet’s The Gleaners (1857) focuses our attention on just three women who are bent over gleaning in the foreground. If you’re looking for the rest of the crowd, they are in the background busy working on the next section of wheat. Although I have no doubt that Millet worked those figures up from sketches and composed them carefully, his low-chroma and low-detail style is more in keeping with the ‘primitive’ and authentic. 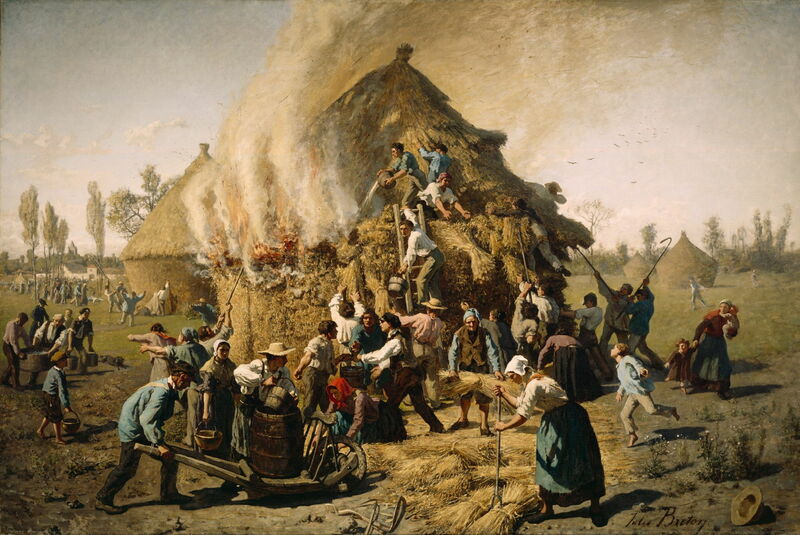 Although Breton painted plenty of full-length single-figure portraits of the rural poor, many of his major works feature most of the population of his home village of Courrières, such as The Burning Haystack (1856). This speaks little about the conditions of the people, but a great deal on their superb team effort to douse a fire in a haystack. The viewer feels almost lost in the minute details recorded here. 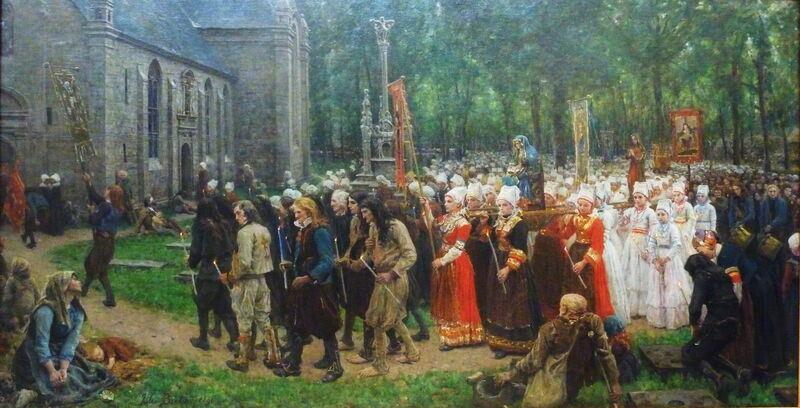 Breton’s last great ensemble painting, The Pardon of Kergoat in Quéménéven in 1891 (1891), seems determined to outdo all those before, with its vast numbers of pilgrims vanishing into the woodland behind. Each of the figures in the foreground has been diligently worked up in great detail, bearing wonderful facial features, dress, and deportment. Away from the finish of the foreground, Breton’s brush has become rather looser, but in comparison with many works from a decade earlier his facture has changed remarkably little. Millet kept to much smaller groups, here the half dozen farm labourers of The Potato Harvest (1855). He provides us with enough detail to know what is going on, but simplifies for the sake of clarity, and in keeping with the theme. No face is shown clearly: these are the anonymous poor who you’ll find in every field. But you can see each potato in the basket, and the stones and debris in the soil. 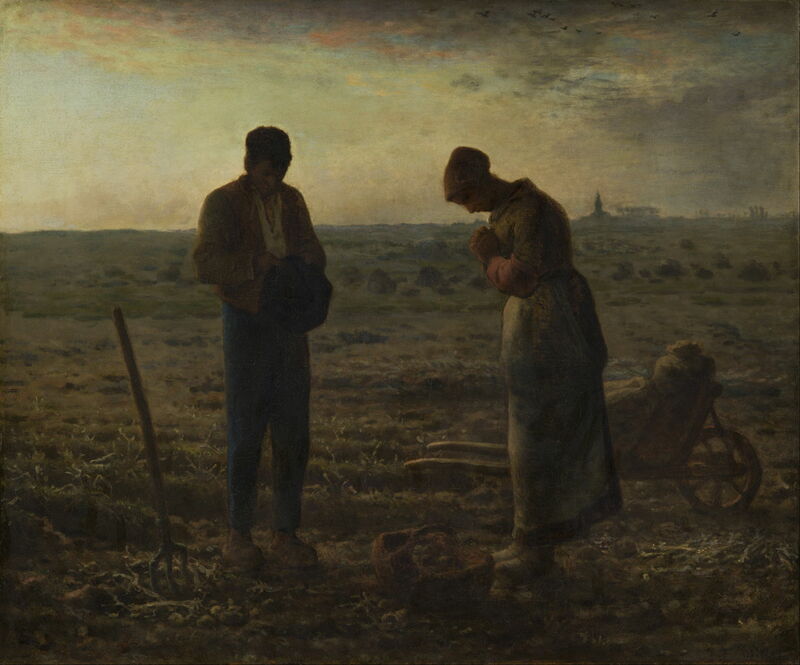 Jean-François Millet (1814–1875), L’Angélus (The Angelus) (1857-59), oil on canvas, 55 x 66 cm, Musée d’Orsay, Paris. Wikimedia Commons. This quest for the bare essentials in the motif reaches its peak in Millet’s L’Angélus (The Angelus), completed around 1857-59. So much of it is vague and implicit in the failing twilight that its two figures are little more than silhouettes, and their barrow readily misinterpreted as a pram containing an infant. What Millet shows us most clearly, though, is the bowed and praying figure of the woman, their small basket of potatoes, and that pitifully poor soil. You don’t have to be a farmer to recognise what they are praying for. 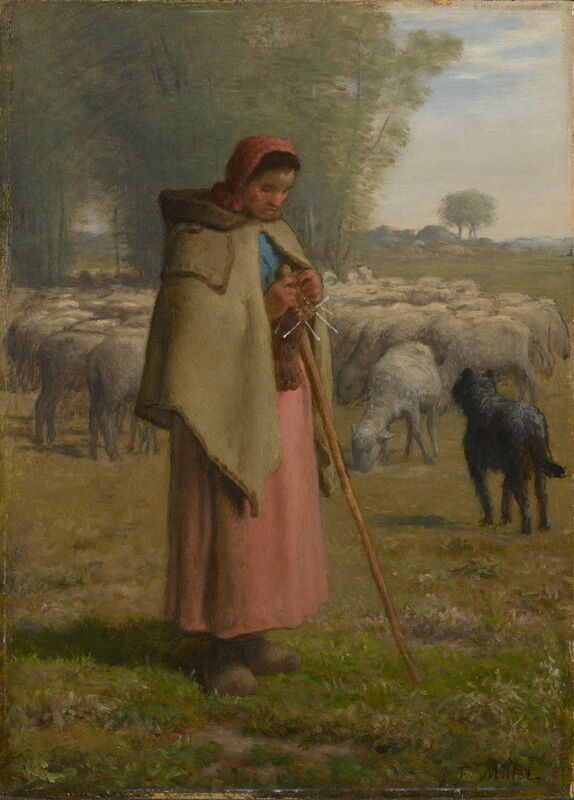 In the middle of his career, Breton started to paint smaller groups labouring in the fields too. 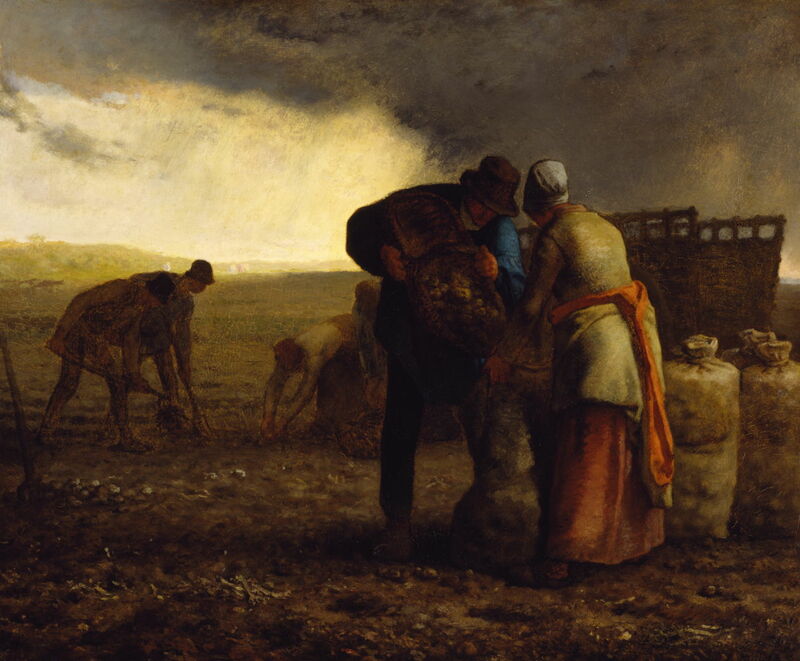 The Weeders (1868) is a fine example, with its startlingly beautiful twilight, and the merest sliver of a moon. The figures of the five women are simplified by the light, but he still paints every last fold and crease in their clothing: his image remains very explicit, leaving little to the viewer’s imagination. 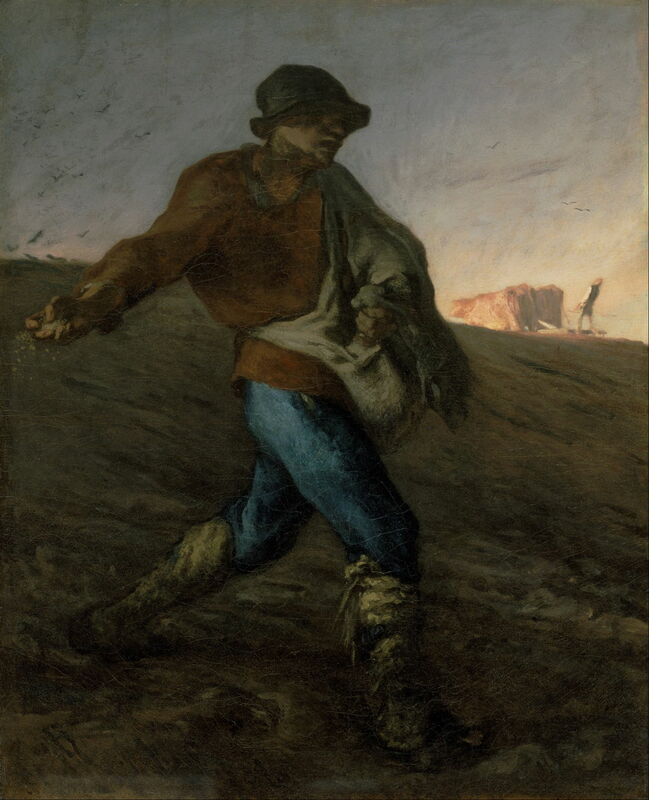 Jean-François Millet (1814–1875), The Sower (1850), oil on canvas, 101.6 x 82.6 cm, Museum of Fine Arts, Boston, MA. Wikimedia Commons. Compare Millet’s The Sower: this is the original 1850 version, and has since been recognised as his first real masterpiece. It is as roughly-hewn as its figure, which again is predominantly implicit, and sparse in detail. Its influence over later artists such as Vincent van Gogh is hardly surprising. Jules Breton (1827–1906), Young Woman Spinning (1872), oil on canvas, 160 x 106 cm, Denison University Art Gallery, Granville, OH. Wikimedia Commons. 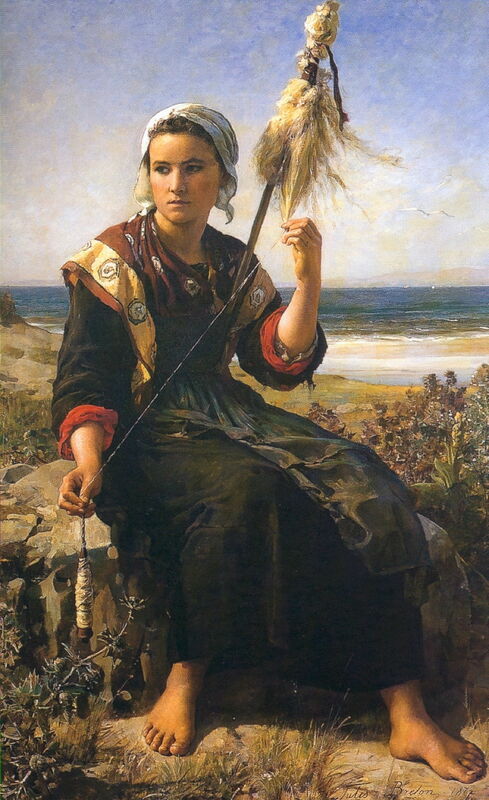 Breton’s single figure paintings are fine portraits, here of a Young Woman Spinning (1872) on the Brittany coast. His brushwork is a bit looser here, becoming quite sketchy in the background. But the woman is shown in perfect detail down to the chipped and dirty toenails on her bare feet. A decade earlier, Millet had painted a Young Girl Watching her Sheep (c 1860-62), which provides a good comparison. We can see that she is engaged in some quite complex knitting, but her hair, face, and clothing are simplified to show only what we need to see. 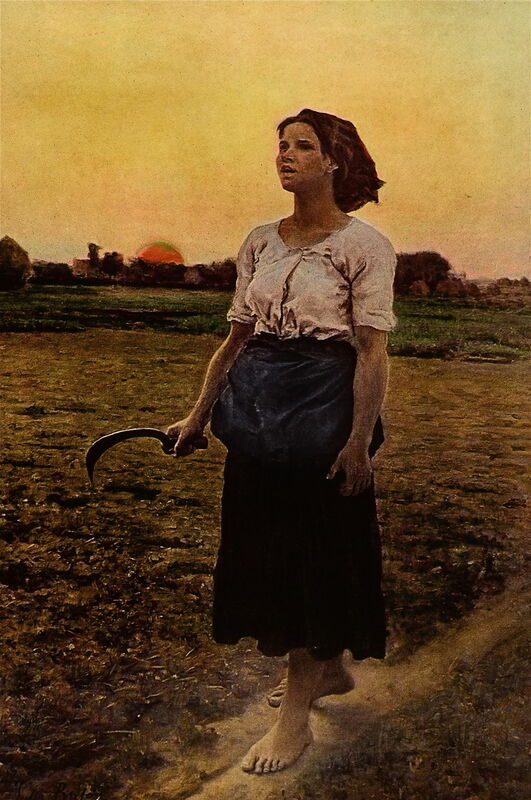 Song of the Lark (1884) is one of Breton’s finest single-figure paintings, and is about as close as he got to concentrating on the essentials in an image. Her face is shown using a more painterly style, but remains thoroughly recognisable. Every crease is shown in her blouse, and her toenails are battered, grubby, and bruised. Breton has taken advantage of the dawn light to simplify her sickle, though. Breton was by no means confined to his ensembles and full-figure paintings of the rural poor, but Millet’s work is far more diverse, and in parts highly innovative. Millet’s Ceres (The Summer) (c 1864-65) is drawn straight from classical mythology, an allegory of harvest time which both artists had painted so extensively. Then there are a few of Millet’s paintings which seem to have been almost experimental, in which he departs from the norms of the day and produces something starkly original, like his very late Bird’s-Nesters (1874). I think that it is invidious to claim either was a greater or more important artist: they are just different. Vincent van Gogh had great respect for, and was influenced by, both of them. What better judgement could anyone want? Posted in General, Life, Painting and tagged Barbizon, Breton, Millet, painting, van Gogh. Bookmark the permalink. It is interesting how similar and different the two artists are. There is an interesting show of pastels at the Boston Museum of Fine Arts currently that shows several wonderful works by Millet, arguably the (or at least a) highlight of the show. The delicacy of the pastels requires them to spend much of their time in storage, displays are infrequent and short. Well worrh a visit. Thank you. I’d love to be able to visit. Hopefully many others will.